Bringing a cuddly, purring bundle of kitty joy into your home is always an exciting experience, whether you’re getting a pet for the very first time or expanding a growing family of pets. When getting a kitten, it’s important to be aware that your new fur baby will be completely reliant upon you to help make the transition from his mom or the animal shelter to this new and strange place. Making sure that your new kitten is safe, happy and content is the responsibility of everybody in the household. Whilst kittens can often make the perfect pet for children, it’s important to ensure that they are ready for the initial adjustment period and know exactly what they need to do to cultivate a great relationship with their new kitty. We’ve put together some top tips to help you prepare for the arrival of a new feline addition to your family. Although you will undoubtedly want to get your new kitten home as soon as possible, taking a baby kitten away from their mom as soon as they’re old enough to leave her side isn’t always the best decision. Although it won’t damage a kitten’s health to adopt them at around six weeks of age, waiting until they are around ten or twelve weeks can be a far better choice to make, since the extra weeks spent with her mom and siblings means that your kitten will be more confident and have a better idea of what is and is not acceptable behavior. Adopting a kitten whilst they are still very young could mean that they are more scared and confused when arriving in your home, leading to the risk of more problems during the adjustment period. When bringing your new kitten into your home for the first time, you’ll want them to know straight away that they are somewhere that they are safe and have everything that they need. So, it’s important to ensure that you have all the essentials to hand, from tasty cat food to kitty litter and plenty of toys for them to play with. When it comes to choosing food for your kitten, opt for a reputable brand – if possible, pick out food that is specifically designed for young cats, since this will contain all the nutrients that they need to grow into a strong, healthy adult cat. Vet approved cat food is always a great choice! 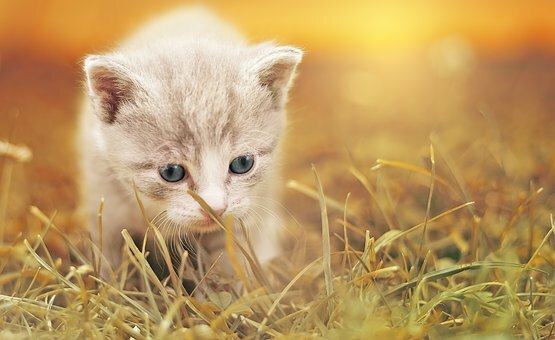 For the first few days of being in your home, don’t be surprised if your new kitten simply wants to hide all the time and get acquainted with their new surroundings on their own terms. Bear in mind that cats tend to enjoy hiding in tight spaces; this makes them feel safe and secure, so don’t worry if you can’t find your kitten – he is probably hiding underneath your bed or behind your sofa for a while. However, when they do begin to feel more comfortable and start to venture around the house a little bit more, make sure that you have plenty for them to see and do – kittens are inquisitive and playful, and will quickly make anything that they find into one big cat toy! Take a look at these top rated cat toys for keeping your new fur baby entertained and having fun. Although your kitten may end up finding an unexpected place in your home that they seem to like sitting in, it’s good to make sure that they have a designated space, such as a cat bed or even an enclosed box, that they know belongs to them and they can retreat to to sleep or simply rest. Since cats enjoy being in enclosed spaces, a covered bed or even an open cat carrier can do the trick well. Make sure that it is somewhere that will be warm and comfortable for them; a fleecy blanket or soft pillow is the perfect addition to any cat bed – the cozier, the better! Luckily for you, cats are perhaps the easiest pet to toilet train – they will instinctively bury their waste, and most kittens will have already watched their mom go to the litter tray, which is why many will begin using it at a very young age. However, in a new environment, it’s important to note that your kitten might not be too sure about where her litter tray is or that they should be using it, so expect some accidents and be prepared. Bear in mind that you should never shout at or punish a cat for having an accident since this could stress them out and make the situation even worse. When your kitty wakes up from a nap, or a short while after she has finished a meal, place her in the box and encourage her to dig. Your kitten will quickly catch on to the idea. Don’t forget to give praise when she uses it! It’s hard to deny that cute little kittens are the best at giving cuddles, however, no matter how much you want to pick your new cat up and give him a squeeze when you first get him, it’s a good idea to limit handling as much as possible during the first few days at least, whilst he adjusts to his new surroundings. If you have picked a kitten that seems inquisitive and friendly, then chances are, he will come to you and allow you to cuddle him once he’s gotten used to the new place and his new humans. Never force a kitten into being petted or handled if they don’t seem comfortable with it – study their body language, and you’ll quickly learn whether or not they’re happy with being petted. Bear in mind that handling your kitten too much when they don’t want it could put them off letting you do it in the future. This entry was posted in Family and tagged kitten.